Savy stepped off the trailer and immediately locked her sights onto a big orange cat that was in the bushes 30ft behind her. Savy is afraid of 3 things, cats, jump standards and twilight shadows. We think the barn cats torment her at nighttime. I once watched one of our barn cats named Jasmine laying on Savy’s hay, and whenever Savy would try to take a bite Jasmine would move to that spot. A full size horse couldn’t eat her dinner because a tiny little cat was using it as her bed! Then Jasmine tried to play with the hay Savy was chewing while it was in her mouth. A cat is the only thing that stops her dead in her tracks. Back to our ride: Savy continued to dance around and crane her neck in the cross ties while I was trying to tack her up so she could keep an eye on the cat. Silly girl. 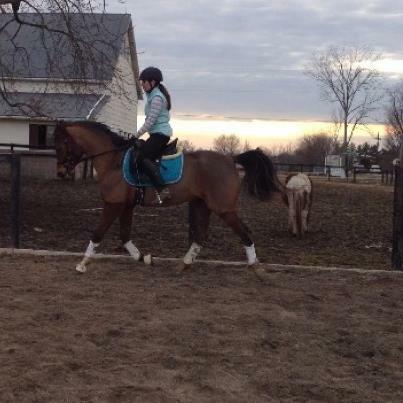 We had an excellent ride and Savy was a superstar….but we did have a little glitch. She fell!! My baby horse fell! I’ll explain. Since Savy is only 3, I usually lunge her for a few minutes before I ride to get out any bucks and to help her relax into her work. It would do her no good to realize I can actually fall off her, so any kinks I can workout before I ride is a good deal. If she hasn’t been worked for a few days she is a maniac on the lunge line for the first 5 minutes. I think she gets excited and she feels frisky so she’ll bolt, for no real reason, except, it seems, to give me heart failure. Since she’s on a circle she leans a lot and really bends her back legs. She can get away with this behavior in our arena at home because the footing is spectacular, but since we were in an indoor with regular sand footing, she fell. Her back legs just slipped out from under her. She looked totally stunned, but she jumped right back up and didn’t miss a stride. She didn’t hurt herself but it was a little disconcerting. I’m really hoping this little episode will help her be more sensible on the lunge line from now on. She did wake up Saturday stocked up (fluid retention in the legs which makes them look puffy) in all 4 feet! I frantically called the vet and learned that stocking up is harmless and that she just needed some exercise. Aside from that little flop, we made a lot of progress this weekend. My trainer rode her Friday and worked on bending and even introduced the shoulder-in, which Savy rocked. And she’s just about nailed her canter transitions. We’re aiming to show training level at our next show in April.